Note: This is part of a series of famous photographs taken by Andre Villers, a friend and confidant of Picasso. 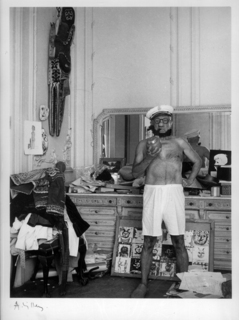 Andre Villers met Picasso in the street in Vallauris in 1953 when Villers stopped to take his photograph. From this chance meeting a great friendship grew between the two artists which was to result in numerous photographs of Picasso, his friends and his studio. Villers has held solo exhibitions all over Europ e and many of his prints are held in the permanent collections at the Picasso Museums in Paris, Barcelona, Vallauris and Antibes. He has worked closely with the writer Jacques Prevert and the photographer David Douglas Duncan. Printing: Printed by the photographer in 1989 Ref: Picasso Vu par Villers photographies, page 44 Authenticity: A certificate from Jean-Luc Mercie, the photographic expert and author of numerous books accompanies this purchase.